Sometimes it takes as long to burn a 2 acre prairie as it does a 40 acre one. Today Kathie and I took photos while Rich Henderson and a skilled Prairie Enthusiasts crew did a prescribed burn at Koltes Prairie. Koltes consists of two high quality prairie remnants that were recently purchased by the Natural Heritage Land Trust as part of a major acquisition in the Town of Westport. 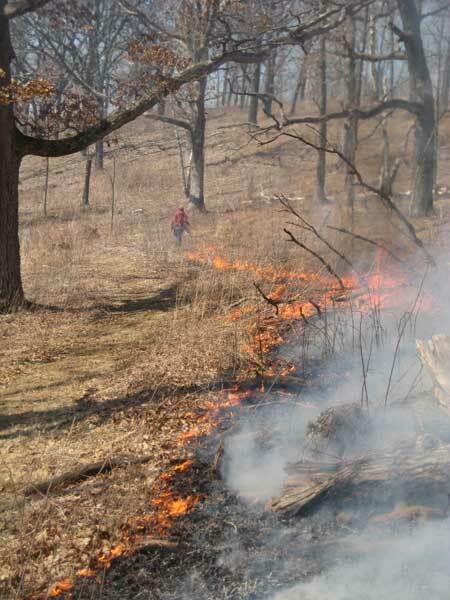 The goal today was to burn a 2-acre piece of this prairie that is situated in the midst of a larger remnant. 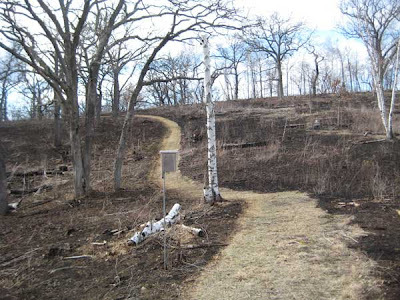 Although fire breaks had been mowed, it was essential to keep the fire line contained by creating black lines all the way around the 2-acre piece. A large pumper unit was available, but most of the control was done with backpack water sprayers. Although the wind was relatively light, and the humidity not too low, it was a challenge to keep the fire lines contained. The crew had to move slowly, and used lots of water to keep the fire line straight and sharp. The whole burn took 1 1/2 hours. Because this was a relatively late-season burn, early-growing species such as bird's foot violet and shooting star will probably be considerably suppressed. However, late-season prairie species should do well. Among others, this prairie has large amounts of prairie gentian, rattlesnake master, prairie dropseed, lead plant, and white prairie clover. 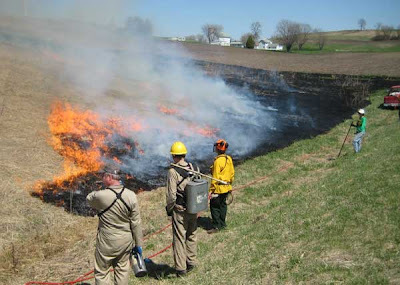 Because of the well planned burn program, it is virtually brush free. 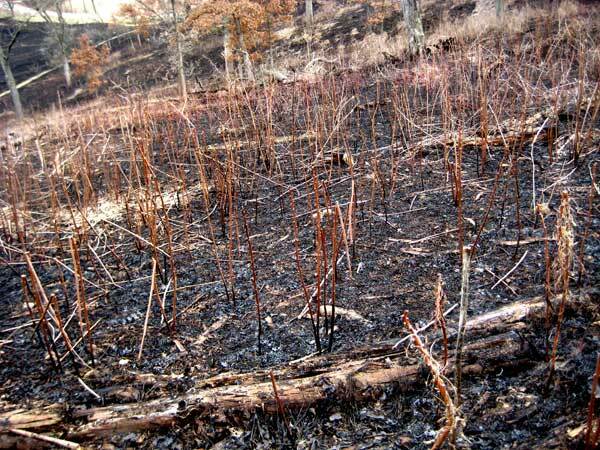 Now that burn season is over, it is time to turn to early control of invasive plants. 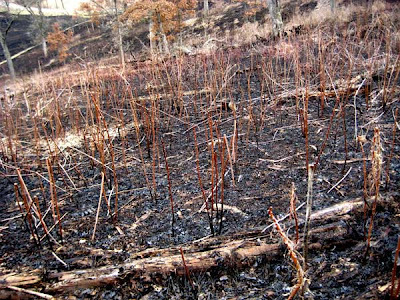 One of the main advantages of burning a natural area is that it creates a barren landscape where new shoots can be readily seen. Although most of the "bad guys" (sweet clover, wild parsnip, etc.) are not up enough yet to find, some species are already visible. Among these is the strongly clonal Arnoglossum atriplicifolium (pale Indian Plantain, which we are calling PIP), which is already widespread at Pleasant Valley Conservancy. Although we don't have garlic mustard, we do have this annoying invader. 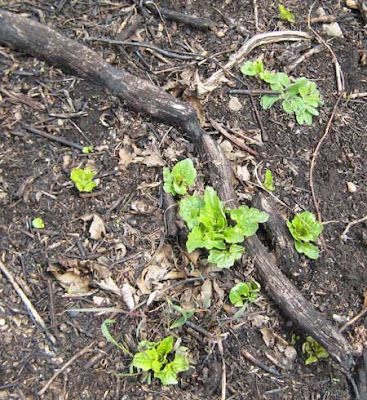 Those who have been following this blog will remember that last summer I discovered that PIP forms extensive rhizome systems and forms root suckers throughout. In our sort of savannas, it is highly invasive. (The fact that this is a clonal species had been published over 25 years ago in an obscure botanical journal, but was not generally known in our area.) Last summer's clones were so large and dense that no other species was able to become established. We spent a lot of time getting rid of this species, but knew that we were not eliminating the underground rhizome system. 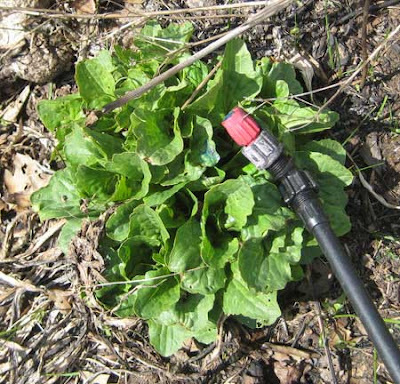 We therefore determined that this spring, in an effort to eradicate the rhizome system, we would start spraying new shoots as soon they were visible. As it turned out, PIP was one of the first species to appear in areas where it was clonal, even before other cool-season forbs (such as shooting star, columbine, golden Alexanders, etc.) 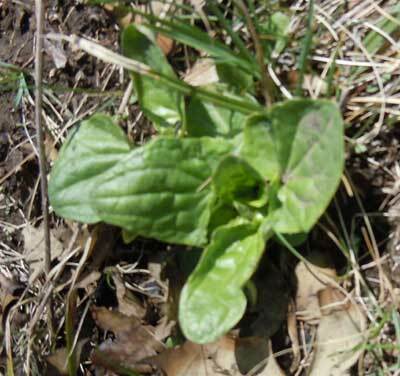 Since it grows in large colonies and has characteristic leaves, it has been easy to spot. The photo to the left shows a typical scene. 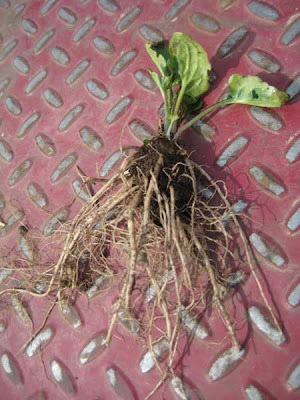 Each shoot has arisen from a root sucker on one of the underground rhizomes. In a circular area about 20 feet in diameter, I estimated that there were around 1000 shoots! Because of the black background remaining from the burn, these shoots stand out well. Even the tiny ones (a few visible in this photo) could be spotted. Fortunately, last fall we had made careful notes of where this plant was present, and were able to start spraying about a week ago. Amanda spent a couple of extra days on some of the densest stands, Kathie and I both took our turns, and the complete crew will endeavor to finish the job within the next week. We elected to use a foliar concentration of glyphosate (2%), since this herbicide has no residual activity in soil and will not affect later-growing species. After we had finished our spraying for the day, Kathie dug up a few plants from one of the sandier savannas. In sand, the roots are easy to clean of soil, making it possible to see what these young suckers look like. As the photo shows, these tiny plants have massive root and rhizome systems. Also, at the base of each stem is a cluster of dormant buds (not visible in the photo). Obviously, you can't get rid of a plant like this by pulling it up, since you will never get all the rhizomes. Herbicide is the only way. The cool spring is delaying plant growth, but a few things are finally appearing. Prairie people generally look first for pasque flowers, which get their name from their association with Easter. 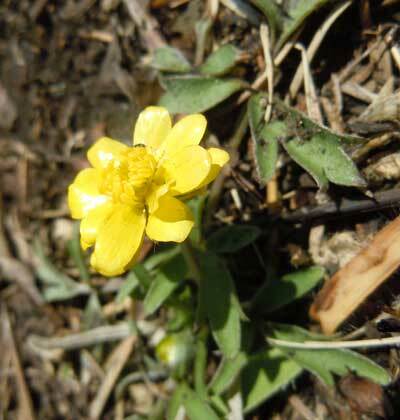 For oak savannas, on the other hand, the early buttercup, Ranunculus fascicularis, is first to appear. We generally find this tiny plant first in unburned areas that have been mowed (which keeps down taller growing competitors), but a few days later it will start to appear in burned areas as well. The photo here is by Kathie. This species has the relatively high C value of 6, and is one of our most reliable early spring flowers. According to Cochrane and Iltis, it is found in southern Wisconsin where its prime habitat is the oak savanna, although it might also be found in dry to dry-mesic prairies. A number of other plant species are already visible now in the vegetative state, but won't be flowering for some time. These include golden Alexanders, Jacob's ladder, early meadow rue, and zig zag goldenrod. Another early species that we aren't so happy about is pale Indian plantain (Arnoglossum atriplicifolium) which we have given the derogatory name of PIP). If you have been following this blog, you know that last year we were overrun with this native but fiercely clonal and highly aggressive species. We don't want to eradicate it, but we definitely want to knock it back. Since its shoots are easy to recognize (see Kathie's photo above), we will be spraying them (probably with glyphosate) as soon as they get large enough. Now that burns are over, spray season begins! Yesterday and Tuesday (April 13 and 12, 2011) we had great burn weather and were able to finish our planned burns for the spring. Despite the fact that we are having a cold spring, this year we were able to finish our burns earlier than previously. Partly, this was due to favorable burn weather when large crews were available. The three burn events this spring were March 31 (15 acres), April 5 (44 acres), and April 12-13 (26 acres), for a total of 85 acres. Last spring we burned 76 acres. 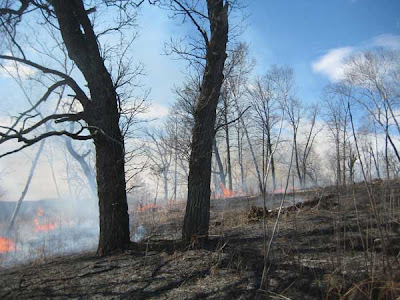 These burns were divided almost equally between prairie and savanna/woodland. On Tuesday we burned three planted prairies (Valley, Crane, and Ridge), and three oak woodlands (Units 13, 21, and what we call the Triangle). 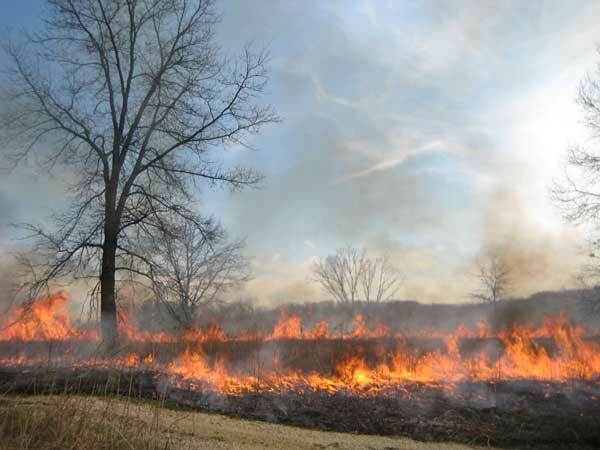 On Wednesday we mainly burned the East Basin, which is a planted prairie that is only in its first growing season. 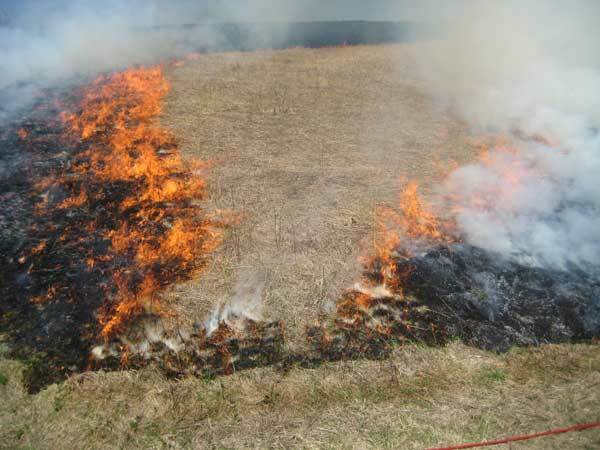 Because a lot of the East Basin had been mowed (standard practice for a planted prairie in its 1st growing season), fuel for carrying a fire was quite patchy. Therefore we spent quite a bit of time doing internal lighting. 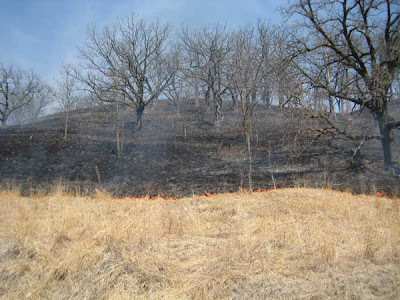 The photo above shows the Ridge Prairie in a late stage, when its two fire lines (head and back) are just about to merge, thus completing the burn. The lone cherry tree has survived at least 4 fires such as this, although its long-term fate is probably sealed. The photo above is a late stage in the Unit 21 burn. Because most of this woodland/savanna is a fairly steep hillside, it burns very well. Because of these good burns, we are looking forward to substantial advances in our brush control program. 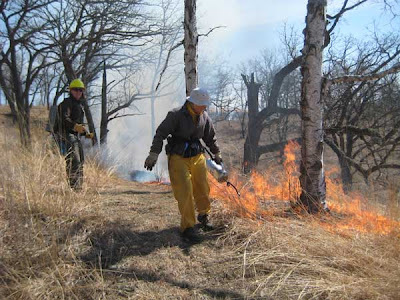 Concerns are often raised about the detrimental effects of prescribed fire on animals, especially relatively nonmotile invertebrates. Since (at least some) invertebrates survive prescribed burns, escape or avoidance mechanisms must come into play. During my recent surveys of the results of our two large burns, I frequently observed patches, some tiny, others reasonably large, that had not burned. These unburned areas are generally called refuges ("refugia" in the scientific literature). The heterogeneity of savanna and prairie landscapes is self evident. I have spent quite a lot of time watching fire spread across the landscape. Although many areas show virtually 100% burn, in other areas, small or large unburned patches occur. These tend to be more common in savannas than prairies, but even prairies show small unburned sites. The photos here provide a few examples, and illustrate the mechanisms by which fire refuges are created. The base of a tree is often a fire-avoidance zone. Partly this is because the tree itself creates a reduced-fuel environment. Prairie grasses, the most flammable fuels, require full sunlight, and because of the leaf canopy the base of a tree is fairly shady. Also, fire tends to move in complicated patterns around trees, and some parts remain unburned. 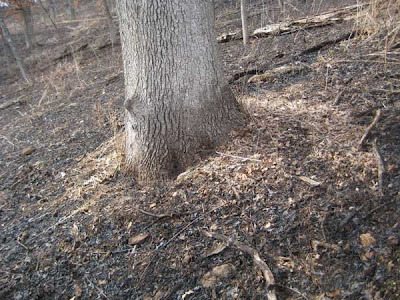 The above photo shows the unburned zone around the base of a large white oak. 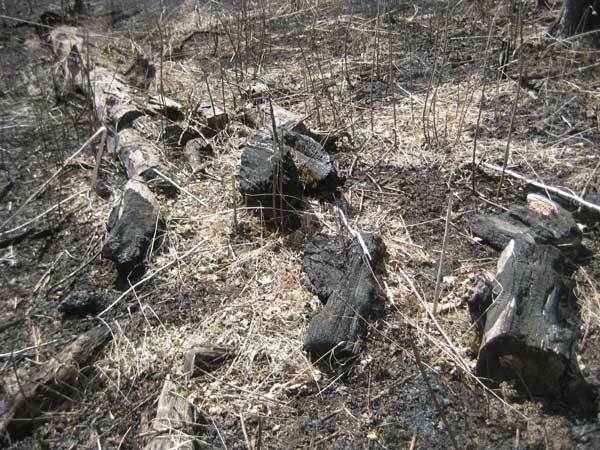 The above photo shows the effect that a large horizontal log had on fire behavior. This black oak had been cut as part of savanna clearing, and was overlooked when the area was canvassed for fire wood. This log provided a good barrier and fire simply passed around this small site. Neither the grasses nor oak leaves, both good fuels, got burned. 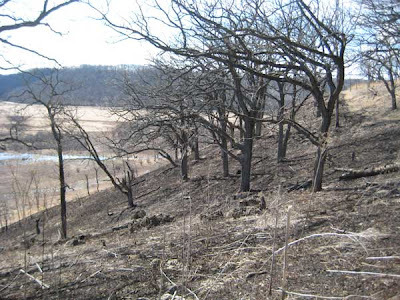 The above photo shows an area that did not burn when we did the big south-slope fire. This is a fairly small area, but there were areas as large as 50 feet in diameter that did not burn. The photo below provides a closer look. Since most invertebrates are small, such a site could provide a reasonable hiding place. Finding patches of problem woody vegetation is important for prairie and savanna restoration. One of the best times to locate problem woodies is right after a burn, when they really stand out against the black background. Other shrub species that are easy to find are gray dogwood, hazel, any bramble (the red stems really show), and honeysuckle. Also, oak grubs. Unfortunately, small buckthorn are harder to see. Sometime in the next few days (before green-up) I plan to do a survey of all our burned areas and mark with the GPS any problem areas. 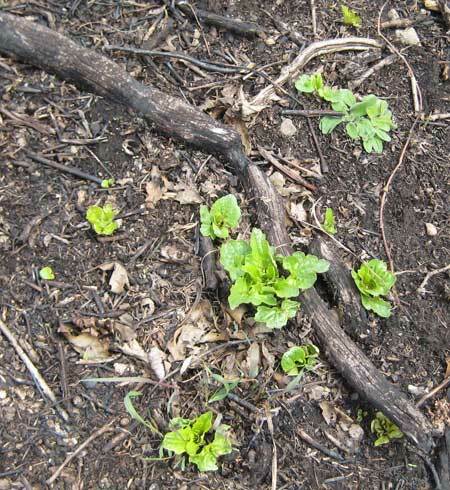 Then the resprouts can be herbicided later in the spring. After some days of unsettled weather, conditions briefly improved and we were able to conduct a major savanna burn. This burn is a vital part of our savanna restoration program and getting it done is a major spring event. The weather was cold but dry, and we had a stiff breeze from the west northwest, which really helped to push the fire through the woods. The results were not as good as last year, but the coverage in most of the savanna areas was over 80%, and lots reached 90-100%. The photo to the left shows an early stage of lighting. 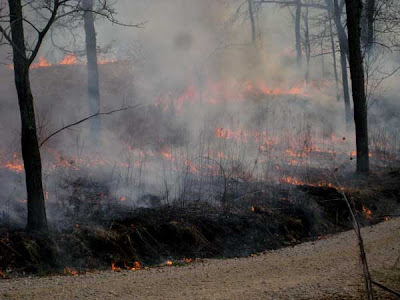 Both the wind and the steep hill contribute to fire behavior. When I returned to this area the next day, I found that coverage was essentially complete. In this area, where the canopy cover is about 50%, the principle fuel is oak leaves, plus some graminoids in scattered sunny areas. The area to the left is mainly white oak, and the upper area is bur oak. 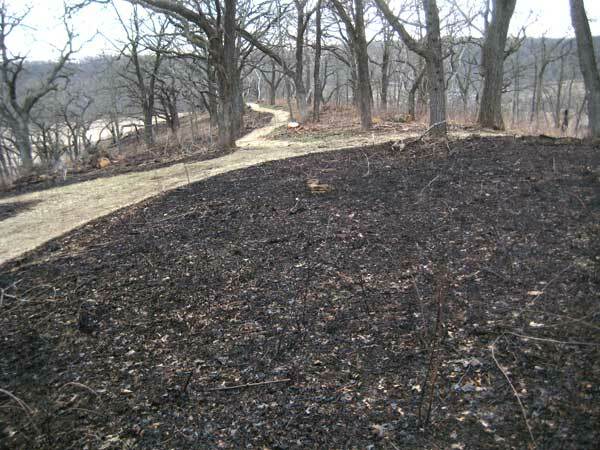 Since the leaves had all winter to deposit, the litter area was fairly continuous, which helps a lot in a burn like this. In the photo above, most of the savanna has already been burned. The R.H. was around 35%, and since this was early afternoon, the sun had had time to dry things off. The photo above shows the ATV trail that goes through the "Saddle" area. 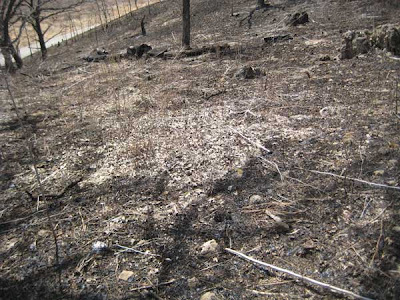 The unit on the left had been burned on 31 March as part of the south slope burn. The unit on the right (11A) has just been burned. The coverage is very good. 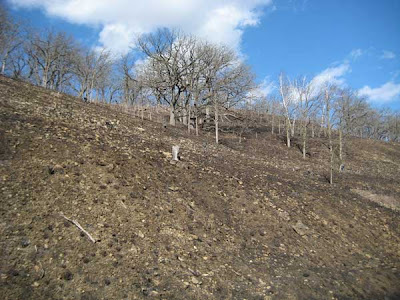 The photo above shows an area at the top of our ridge, where three burn units come together. The unit on the right in the rear was actually burned last November, as part of our North Woods burn. The other two units have just been burned. Since savanna burns are complicated and are more demanding than prairie burns, when conditions are favorable we try to do the largest burns we can. Per GIS, we burned 44 acres! Yesterday Kathie and I spent a couple of hours surveying the areas on the south slope that burned last Thursday. The coverage was very good, virtually 100% in most areas. The first two photos are views looking up the slope from Pleasant Valley Road. The top one shows the area before the burn and the lower one is afterward. 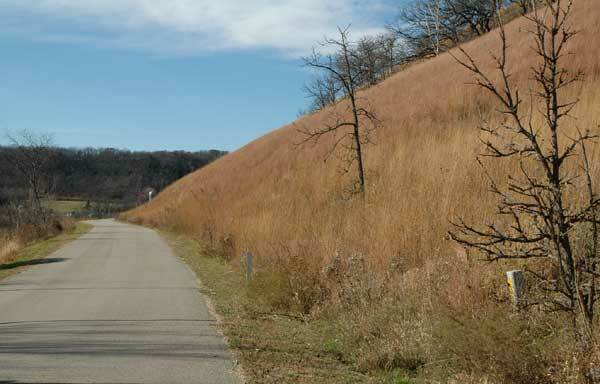 The little bluestem prairie in this area is lush due to the great rains we had last summer. 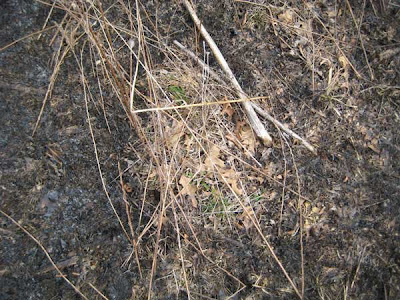 Note in the after-burn photo that the soil is full of small rocks. Indeed, the Dane County soil map calls this soil "stony." The scattered black tufts are the remains of little bluestem plants that despite the rocks are well established in this area. Little bluestem is called a cespitose grass, which means that it is a clump-former that sends up numerous "tillers" from a well established root system. The next photo below is a view from the top of the slope (the edge of the fire break is visible in the distance). This is a typical bur oak savanna. In the more open areas the fuel is primarily Indian grass, and under the trees the fuel is oak leaves. There are scattered areas here that did not burn, as shown by the lighter patches. These unburned areas appear to be mainly bluegrass or another nonnative grass. According to my measurements with ArcGIS, the whole burn on Thursday was 15 acres. 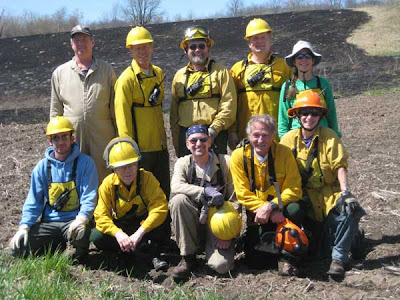 Getting prescribed burns done requires a lot of planning, appropriate weather, and a good crew. Because of the cold March, our burns have been considerably delayed, but yesterday everything came together and we got a lot done. For burn weather, I mostly follow the NOAA web site, and especially a page called "Forecast Discussion". Beginning on Monday, a surface high pressure system with a very dry air mass was predicted to hover over the area and continue through Thursday. The weather was to be coldddd in the mornings, but to warm up a bit by afternoon. The high Thursday was predicted to be about 50 F, with low humidity and light winds out of the south. Good conditions for a burn, and the DNR gave us the go-ahead. Actually, although the wind was light, it was variable, and shifted from north to south and back again. Because we were doing several large and complicated burns, we needed a large crew. We had 17 people, 7 from contractors, 3 of our own PVC crew, and 7 volunteers (including Kathie and me). We needed them all! Thursday morning broke clear and cold, with light winds and a temperature of 22 F. Because of the low temperature, we could not use our shallow well, and had to borrow water from a neighbor. We needed a huge amount of water, and by the end of the day we had gone back twice for refills. Fortunately, I had anticipated the cold and Marci had brought all our water backpack to her basement, and filled them in the morning of the burn. (There is nothing worse than ice crystals in a water backpack.) We met at 9 AM to start getting things ready, and we were finally able to start lighting at 11:15 AM. We burned the south-facing slope, which is a steep hill of about 20 acres, with little bluestem prairie remnant below and bur oak savanna above. 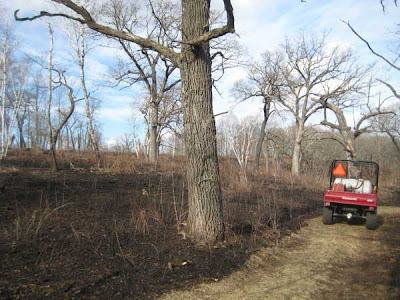 The fuel was primarily prairie grass, but in the upper more shaded savanna, the fuel also had a lot of bur oak leaves. With the light wind, the very steep slope was more critical, and was the dominant factor. A computer program called BehavePlus 4.0 can be used to model fire behavior. One inputs parameters such as fuel type (in our case, tall grass), fuel moisture in %, wind speed, and slope steepness. The output is either flame height or rate of fire spread. With our input parameters, flame length varied from 6 to 11 feet, depending on the windspeed and the rate of spread was pretty fast. Obviously, with such high flame lengths, it is desirable to minimize the size of the fire. 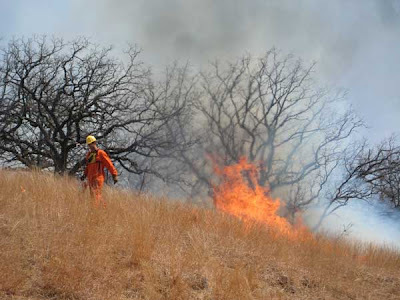 For the past several years we have been keeping the width of the fire line low by using the "strip headfire" technique. This technique uses four drip torches. After putting in a blackline at the top of the ridge, next to our mowed fire break, the other three drip torches moved in parallel to the contours, the uppermost first, then the second, and then the third at the bottom of the slope (along Pleasant Valley Road). The steep hill encourages the fire to move up, but the fire quickly reaches the black line above and goes out. The drip torch operators are in communication by two-way radio, to ensure that they move across the slope in staggered formation. The most critical part of this procedure is the creation of the blackened area at the top of the slope. The photos below show Susan and Stephanie working on this process. (Several more people with backpack water cans remain farther behind to keep the fire line under control.) Also, when this crew reaches the far end of the slope, there is a tricky phase when a vertical black line must be created from the top to the bottom of the slope (at Pleasant Valley Road). The first photo below shows Chris lighting the third strip from the top and the next photo shows the slope in a later stage, when it was mostly black. The whole burn took about 90 minutes. 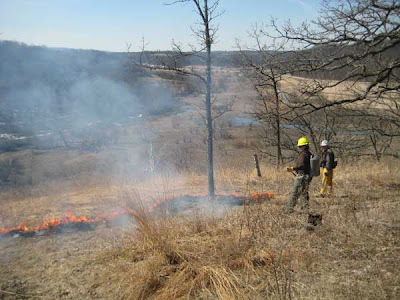 After a short lunch break, we moved to Black Earth Rettenmund Prairie for two more burns. In all, a fine day.